Wow - what a fun piece to do! 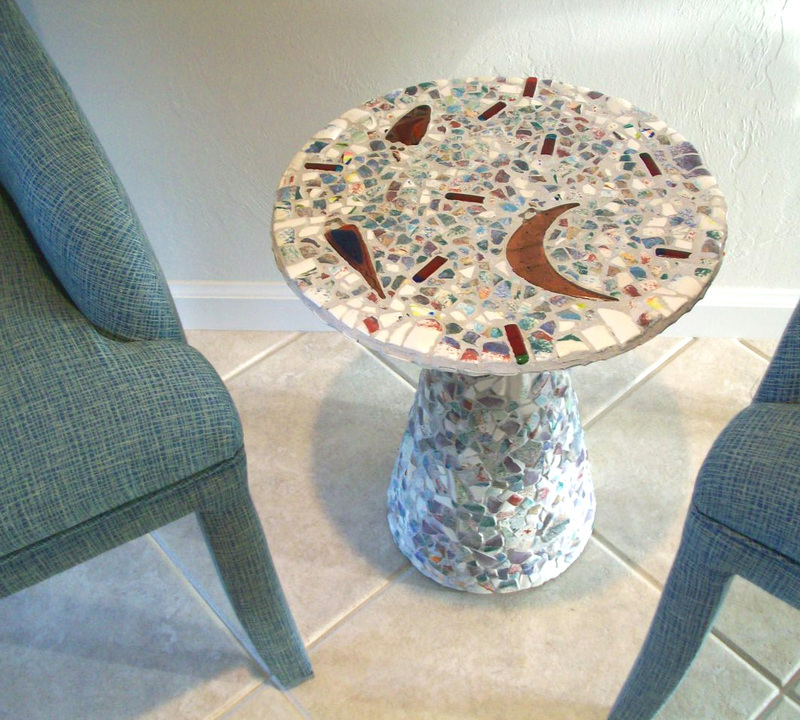 This little table (it's only 16 inches in diameter) was given to me to mosaic using the client's own china - mostly blues and purples, as you can see, plus a glass mobile whose pieces I embedded in the top. Since most of the china was in the form of mugs and bowls, I had to cut very tiny pieces in order for them to have enough of a flat surface that I could attach them to the table surface. So it took a bit longer than I expected. But one thing that helped was that the client did not want any particular design - not even a border edging - so I just fit pieces together like a puzzle. She was very happy with the result, and so was I. I've covered tables before (click here for an example) but have always used glass tile. This was my first foray into the broken-china route. 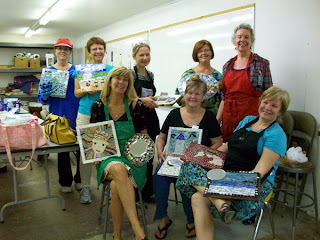 This is the group photo from my first mosaic class, which just ended about 10 days ago. It was pure pleasure, and I think I learned as much as my students! Everyone was enthusiastic and really creative, so I often felt like all I had to do was be there for questions, mostly. Most students were able to complete two projects and eagerly embraced several different mosaic construction styles, material choices, and shapes. Several people expressed interest in going on to an intermediate class, where we'll be exploring 3-D mosaics. What fun!